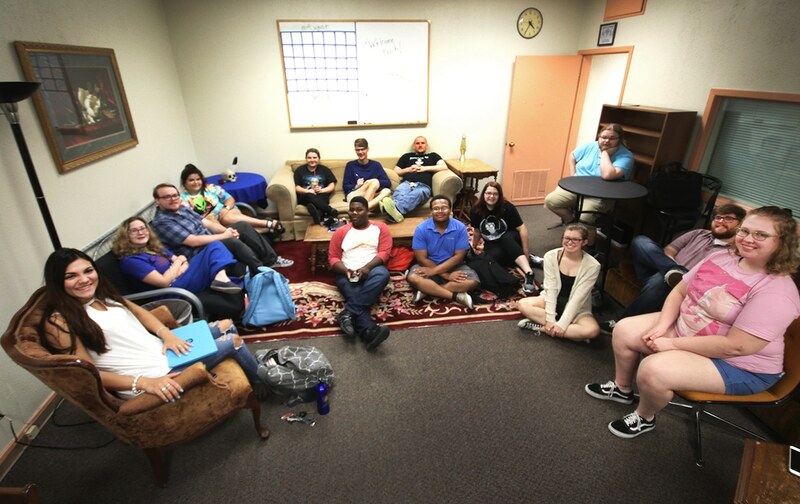 Theatre students at Southern Arkansas University now have a place to hang out between classes at Harton Theatre thanks to the efforts of student volunteers over the summer. They have also transformed unsed space into more usable areas for production. An underutilized room in Harton has been converted into a student lounge thanks to Joey Kaar, a junior Musical Theatre major from Magnolia, Arkansas, and 10 other student volunteers. Kaar said that in early July, he recognized a need for a space students could use while waiting for classes to begin. He decided to covert a room that had previously contained dozens of boxes, chairs and office furniture into a comfortable lounge. “I just finished hanging those pictures yesterday,” Kaar smiled, pointing to pictures on a wall. The room is now orderly and neat, furnished with couches, tables and chairs. Assisting him in creating the student lounge were Joann Shaver, James Rich, Stephanie Blase, Cat Jones, Bodee Starr, Emma Walker, Zack McJunkins, Caleb Russette, Courtney Taylor, and Parker Hamm. Wally Eastland, production designer, said Kaar came to him during the summer asking if the room could be turned into a student lounge. Eastland told him “it was a go” if it was a student-driven project. The student lounge will receive a few other donations, including a Blu-ray player, and be outfitted with a TV and computers for use by the students. Deana Taylor, campus and community welfare coordinator, donated electrical components as well as a coffee maker.